I am trying to catch up on my scrapbooking! The Olympics have given me the opportunity to do so! 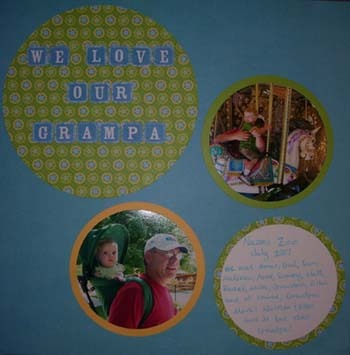 On this scrapbook page I have highlighted Grampa Mark. Nathan and Ellen absolutely adore their Grampa Mark. These pictures were taken at Niabi Zoo. The Niabi Zoo is located near Moline, Illinois. It is the cutest little zoo! Perfect for small travelers. It is classy, but not so big that your kiddos are too tired to enjoy the entire park.